"I was introduced to gumbo by people from Louisiana. They lived in our town for a few years, and taught us Canadians what gumbo is all about....mmmm good and hot! You can make other gumbos the same way using squirrel, rabbit, ham, seafood, chicken, or game." Heat oil in a Dutch oven or any heavy pan. Stir in flour to make a roux. Cook, stirring constantly, until roux is dark brown; be careful not to burn. Add onion and garlic, and cook until slightly wilted. Whisk in water. 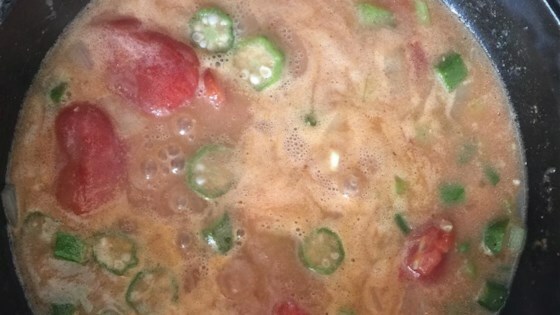 Stir in celery, green onions, tomato, green and red peppers, okra, bay leaf, thyme, salt, pepper, and cayenne. Simmer for 1 hour. Add shrimp and hard boiled eggs; simmer 15 to 20 minutes longer. Adjust seasoning to taste. Serve gumbo over rice. The recipe was great and easy to make, but it was lacking a certain taste. Using broth instead of water would certainly improve this recipe.